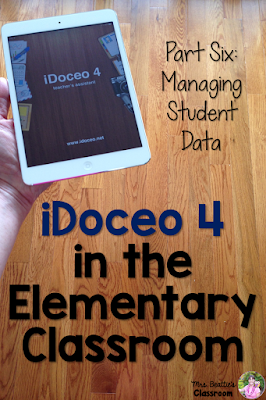 The possibilities for tracking data with the iDoceo app are nearly endless! 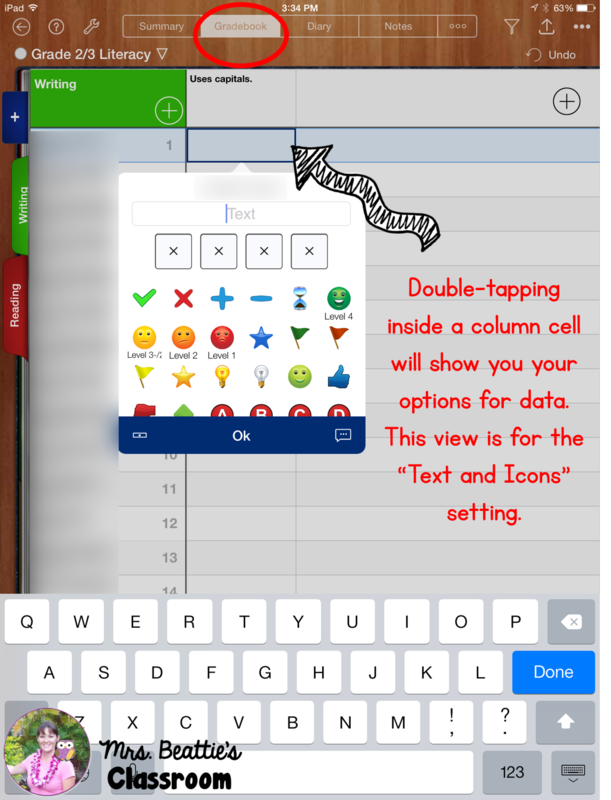 From entering anecdotal notes to icons to letter or number grades, you can customize this to suit the needs of any classroom at any level. I'm going to share a few tips and tricks, but you'll do the most learning by simply playing around with this. Use the sample class that appears when you download the app for the first time as a playground... check out how the Gradebook has been put together to learn how you can customize your own! Each subject will open with one tab already available. 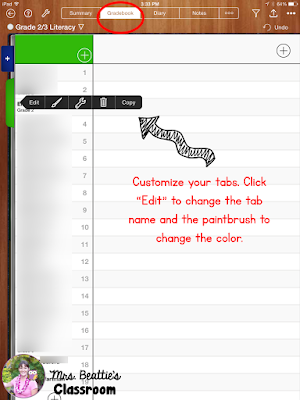 You can tap the tab and select "Edit" to give it a name and customize colors. 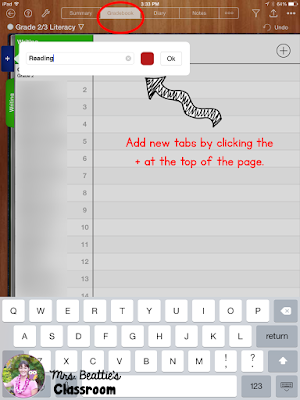 You can also click the wrench icon to re-order the placement of the tabs for this subject, and have the option to "Copy" the structure of this tab to either another tab in this subject or to a tab in another subject altogether! Click the + symbol at the top of the tab area to add a new tab. 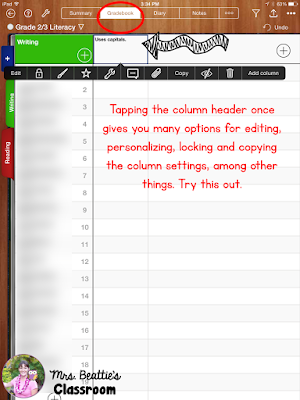 By clicking the + symbol in the top-right corner of the screen, you can add columns to your page. Use these the same way you would on a traditional paper class list. 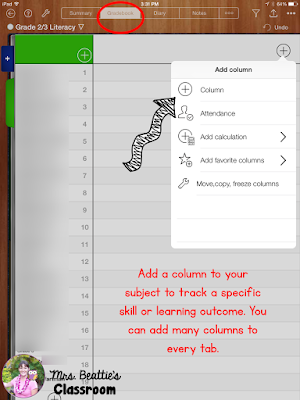 I create many columns within each subject and tab to collect data on different skills and learning outcomes I'm assessing, but also use these columns as checklists for items handed in, etc. 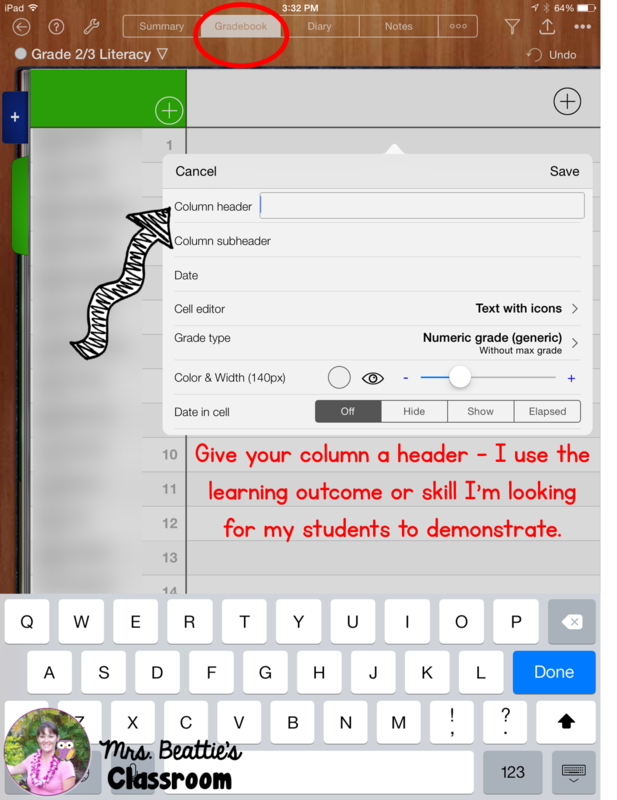 I customize my columns by typing in exactly what learning outcome or skill I'm looking for. Type anything at all in this space. 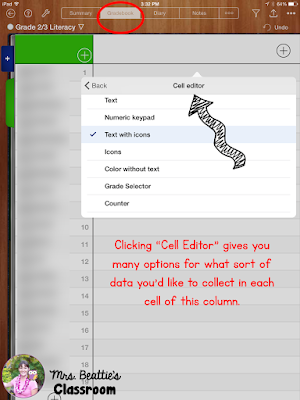 The "Cell Editor" gives you SO MANY options for customizing the sort of data you'd like to collect. From a simple "yes or no" to letter grades to percentages, the options are many. 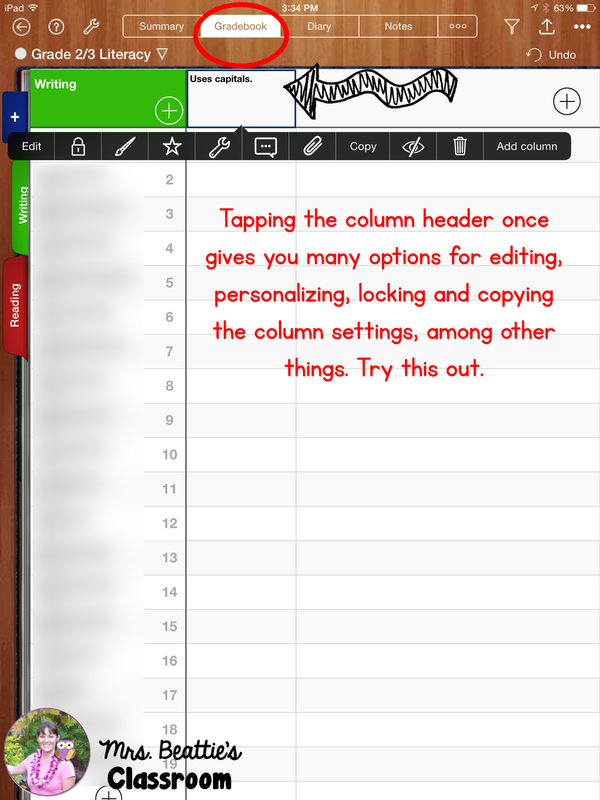 You are even able to customize this with exactly what you'd like to use for this particular column. Try some different options out. Grade types vary from place to place but you are able to customize this to perfectly suit the area you're in! In Ontario, we have a 4-level achievement chart representing grades A to D. I can customize this to exactly represent the levels I use. 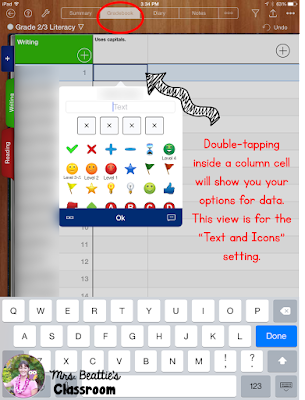 Click the speech bubble icon to add an annotation to the column. This is handy to add more information about what this column is for. Another option here is to click the paper clip to attach a file - a copy of the assessment itself, perhaps?! Double-tap inside one of the cells in your column to open the data entry mode. This is where you'll select the icons or grades depending on how you set up this particular column. In the image below, you'll see the view for the "Text and Icons" setting. There are MANY icons to choose from when you scroll further along. 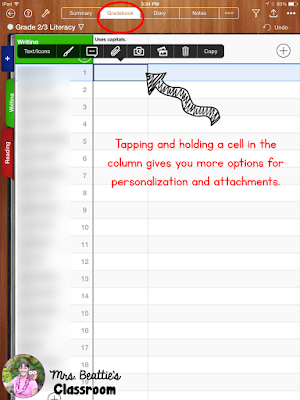 It is possible to have a variety of column types within one tab. For example, the first tab may be a sort of checklist (yes/no) and the next column may be used to collect letter grades. 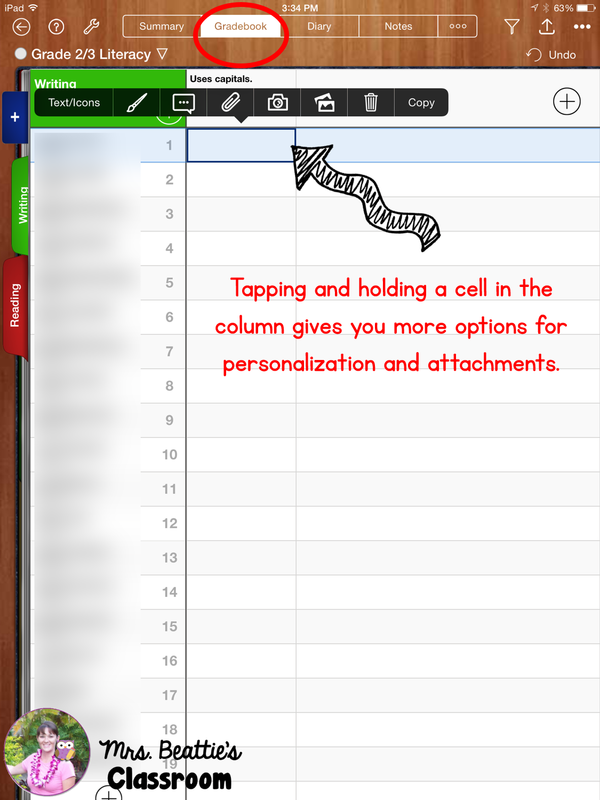 Tapping and holding inside a cell will give you different options. 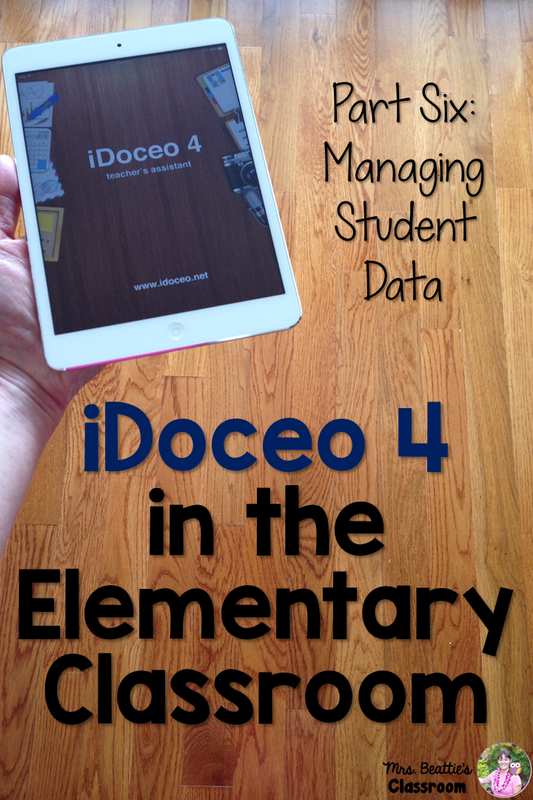 Here is a fabulous place to collect additional information. You can add annotations by clicking the speech bubble (additional information or evidence to support your mark!) 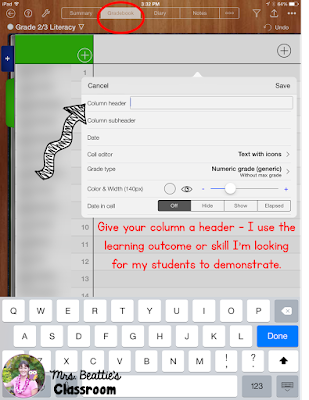 or attach a file or photo of the student's work! I LOVE this feature!! 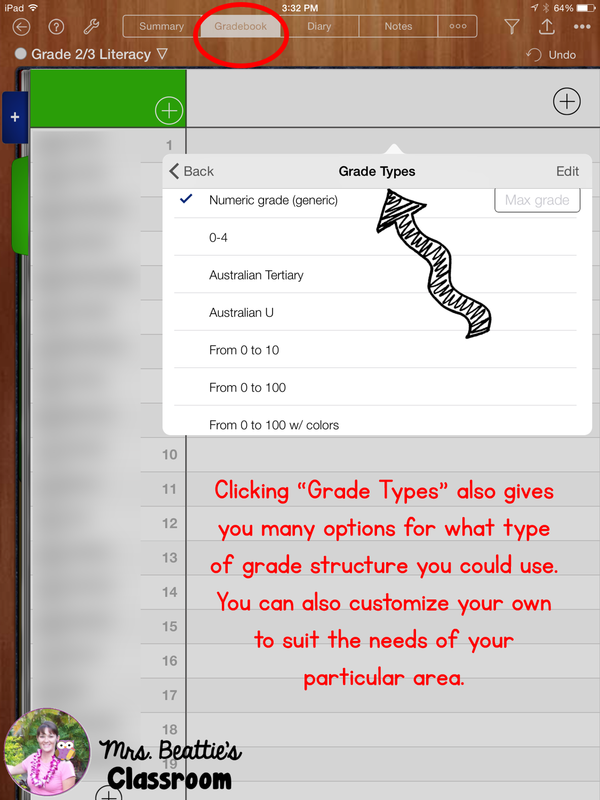 I hope that this post has been helpful as you navigate the features of your Gradebook! Look for the Bloglovin button or email subscription under the "Stay In Touch" header near the top of my page to follow my blog and be sure to receive other great posts! Don't forget to pin this post for future reference! Can you talk about how this compares to planbook.com? I'm on a free trial from planbook until the end of the month but maybe I want to get Doceo instead? I love planbook and have spent HOURS AND HOURS trying to set it up to make it fit my schedule and put in templates etc., but Doceo is so much prettier. I asked Doceo if there was a demo I could try to compare but they said no. Thanks!